On the 11th (Mon), admire the masterpieces at Museo de Arte de Aguadilla y del Caribe and then stroll through Crashboat Beach. You can plan Rincon trip in no time by asking Inspirock to help create your itinerary. New York City, USA to Rincon is an approximately 5.5-hour flight. You can also do a combination of bus and flight; or do a combination of flight and car. You'll lose 1 hour traveling from New York City to Rincon due to the time zone difference. Traveling from New York City in February, expect Rincon to be warmer, temps between 85°F and 76°F. Finish up your sightseeing early on the 12th (Tue) so you can go by car to San Juan. 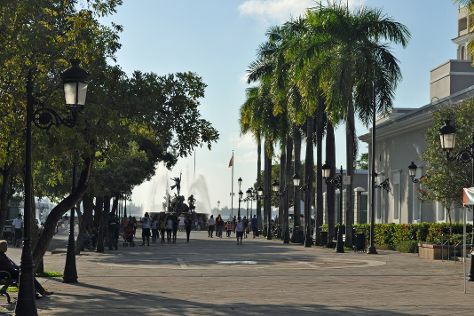 Kick off your visit on the 13th (Wed): stroll the grounds of San Juan Cemetery, then make a trip to San Juan Gate, then get a taste of the local shopping with The Poet's Passage, and finally appreciate the extensive heritage of Paseo de la Princesa. To find more things to do, reviews, photos, and other tourist information, go to the San Juan itinerary planning website . Traveling by car from Rincon to San Juan takes 2 hours. Alternatively, you can fly; or do a combination of car and shuttle. In February in San Juan, expect temperatures between 84°F during the day and 73°F at night. Finish your sightseeing early on the 13th (Wed) so you can travel back home.